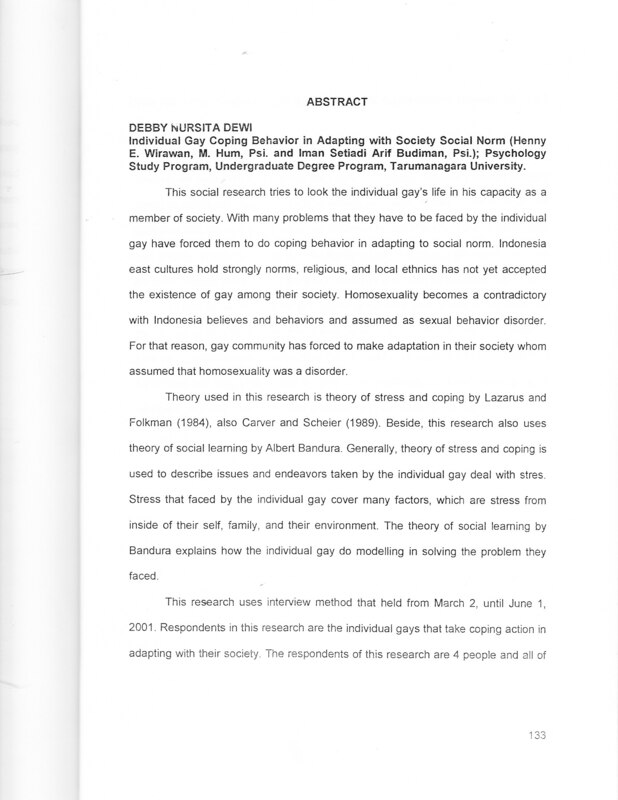 "This social research tries to look the individual gay's life in his capacity as a member of society. With many problems that they have to be faced by the individual gay have forced them to do coping behavior in adapting to social norm. lndonesia east cultures hold strongly norms, religious, and local ethnics has not yet accepted the existence of gay among their society. 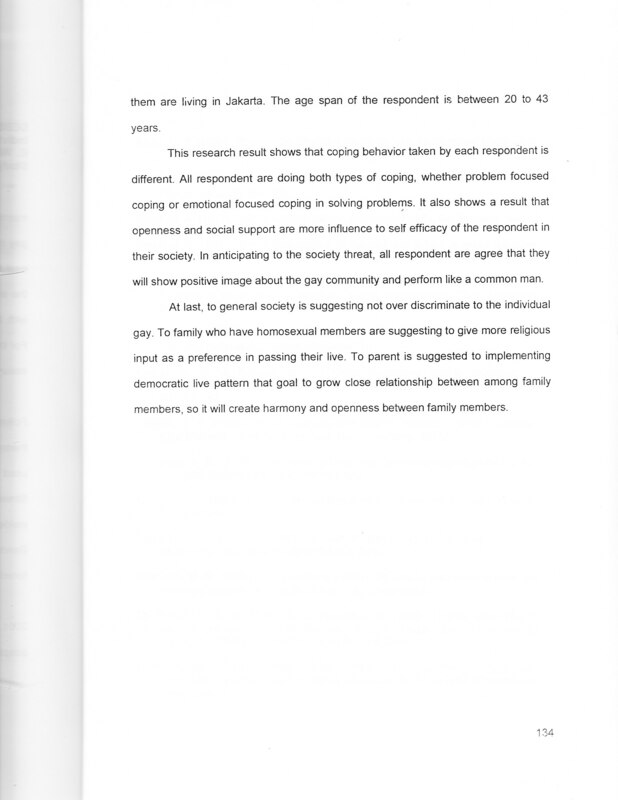 Homosexuality becomes a contradictory with lndonesia believes and behaviors and assumed as sexual behavior disorder. For that reason, gay community has forced to make adaptation in their society whom assumed that homosexuality was a disorder. Theory used in this research is theory of stress and coping by Lazarus and Folkman (1984), also Carver and Scheier (1989). Beside, this research also uses theory of social learning by Albert Bandura. Generally, theory of stress and coping is used to describe issues and endeavors taken by the individual gay deal with stres. Stress that faced by the individual gay cover many factors, which are stress from inside of their self, family, and their environment. The theory of social learning by Bandura explains how the individual gay do modelling in solving the problem they faced. This research uses interview method that held from March 2, until June 1, 2001. Respondents in this research are the individual gays that take coping action in adapting with their society. The respondents of this research are 4 people and all of them are living in Jakarta. The age span of the respondent is between 20 to 43 years. This research result shows that coping behavior taken by each respondent is different. All respondent are doing both types of coping, whether problem focused coping or emotional focused coping in solving problems. It also shows a result that openness and social support are more influence to self efficacy of the respondent in their society. ln anticipating to the society threat, all respondent are agree that they will show positive image about the gay community and perform like a common man. At last, to general society is suggesting not over discriminate to the individual gay. To family who have homosexual members are suggesting to give more religious input as a preference in passing their live. To parent is suggested to implementing democratic live pattern that goal to grow close relationship between among family members, so it will create harmony and openness between family members. "